Plan To Unsnarl Chicago Rail Hits Snags In Suburbs Transportation experts call Chicago's railroad congestion a "calamity." Trains can take two days just to get through the city. But a company's bypass plan has led to anger in neighboring areas, where residents fear new delays and traffic problems. 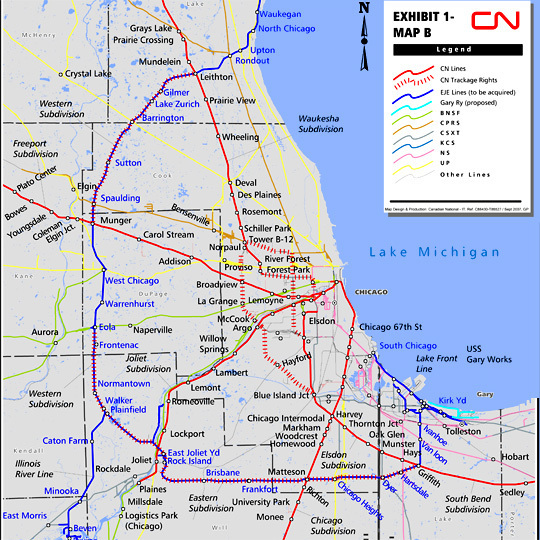 Map depicting Canadian National's proposed bypass route around Chicago's train lines. 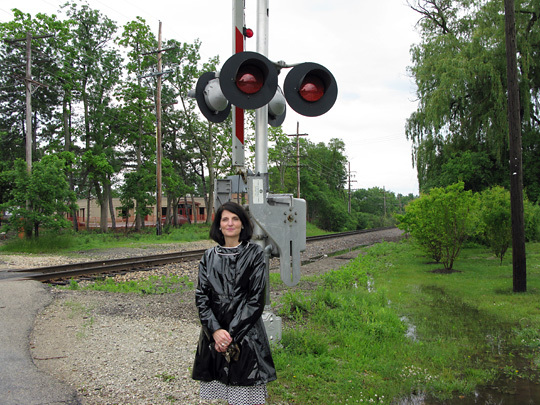 Barrington Village President Karen Darch stands at one of the EJ&E crossings that she fears will see an enormous increase in freight train traffic. A "calamity," a "rail meltdown" and "chaos in the supply chain" — those are all ways transportation experts and executives describe the state of railroad congestion in Chicago. "And it's only going to get worse," adds another. Railroad companies say it takes a freight train about two days to travel from the West Coast to Chicago — but the same train sometimes needs another two days just to get through the city. In some neighborhoods in and around Chicago, freight train gridlock essentially paralyzes traffic and severs towns. In places like Franklin Park, a suburb just west of Chicago, railroad crossings are often blocked for long periods, sometimes even hours, with trains slowly rolling through or stopped on the rails. "I tell people going across town to cross the tracks the first chance you get," Franklin Park Mayor Dan Pritchett said, "because you may not get another chance for a long, long time." And if cars cannot get across the tracks for five, 10, 15 minutes or longer, neither can Franklin Park's emergency vehicles. "This town is forced to have not one, not two — we have three fire stations in a town of 19,000 because of the trains," Pritchett said. To keep crossings clear as they await space in a rail yard, some railroads will stop long freight trains short of the crossings and have them sit, idling loudly, in residential neighborhoods. "Those trains can sit there for hours every day or all weekend long, and finally they'll move on. And then before long, another one will be sitting there," said Garth Taylor, whose air-compressor business sits right next to the tracks in Franklin Park. "The sound doesn't bother me so much as the smell does," Taylor said. "If the wind is out of the west, it just kind of pushes those fumes right into the building, you know. You can smell it ... diesel fumes." Since the mid-1800s, Chicago has been the nation's railroad hub. "We have rail infrastructure that in many cases is well over 100 years old, and in some cases we still have the original stuff," says Jim LaBelle, transportation expert for the regional advocacy group Chicago Metropolis 2020. "So here we are, trying to operate in the 21st century in many cases on 19th century infrastructure." 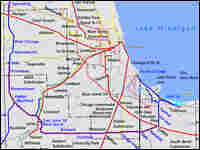 Six of the seven largest railroads in North America have tracks that converge in Chicago. And many other smaller railroads have tracks in the region, too. These railroads carry more and more freight every year — some 2 billion tons of everything from lumber, grains, coal and chemicals to food, electronics and cars. About 40 percent of America's freight passes through Chicago somehow. That amounts to 500 freight trains in and around Chicago each day. Throw in the 700 commuter trains going in and out of Chicago's downtown area — which share the rails with freight trains — and you've got a mess. "It's a very frustrating and costly process, trying to make it through the city right now," said Karen Phillips, the vice president of government affairs for Canadian National Railway. "We find that it can take one of our freight trains from the North Side to the South Side of the city — which is a distance of about 30 miles — as long as it can take our trains to get from Winnipeg to Chicago — which is over 800 miles." Canadian National wants to bypass the Chicago bottleneck by moving many of its freight trains out to a bypass route around Chicago, on the Eliot, Joliet & Eastern railroad tracks. CN has proposed buying the EJ&E Railway from its owner, U.S. Steel, for $300 million. The nearly 200 miles of track runs from Gary, Ind., on Lake Michigan's lower shoreline west to Joliet, Ill., about 50 miles southwest of Chicago, and north through the Illinois cities of Aurora, Elgin and other smaller communities. It then turns northeast to Waukegan, on the Lake Michigan shore. CN has tracks that intersect the EJ&E north of Chicago, and the railroad company plans to run many of its freight trains that are not destined for Chicago but to places farther south, like Memphis or New Orleans, on the EJ&E. The route would greatly improve the CN railroad's efficiency. But the plan is being widely opposed by the communities along the EJ&E. "This is probably the biggest issue to ever face our community," said Karen Darch, village president of Barrington, a quiet and affluent suburb about 35 miles northwest of Chicago. Barrington's residents would see the number of freight trains on the EJ&E tracks go from three to five a day to about 20. "The impact it will have on life here is tremendous. It cuts through the heart of town and will impact school kids, cars, ambulances, fire trucks, every aspect of life," Darch said. The plan would more than quadruple the number of freight trains running through Barrington, Darch said, and would frequently halt traffic on main roads. And that, she said, would cripple businesses, while increasing noise and pollution — and not just in Barrington, but in several other communities along the EJ&E. Darch and other opponents downplay the NIMBY — or "Not in My Backyard" — nature of their concerns, arguing that the shift of freight trains that would go through Chicago out to a bucolic bypass route would just shift the same traffic problems to areas that have little infrastructure to handle them. The opposition also says CN's bypass could hamper efforts to address the more systemic freight rail congestion in the region. That plan, a $1.5 billion public-private proposal called CREATE, would add freight rail capacity to the Chicago region and eliminate many grade crossings and rail choke points. But many regional transportation experts say that with little public funding thus far committed to breaking up freight gridlock in Chicago, Canadian National's purchase of the EJ&E to create its own bypass — and its pledge of $40 million to lessen the impact on communities — is worth supporting. "If this acquisition goes through, it will reduce the public cost of CREATE by a couple hundred million dollars," says Jim LaBelle of Metropolis 2020. "You have the potential to add considerable capacity to not only the Chicago region's freight rail system but to the nation's, really a critical link to the nation's freight system, with very limited public capital involved." LaBelle says that when freight trains sit in Chicago, businesses turn to trucks to ship their goods, which burns more fuel and clogs area roads and highways even more. He says the nation cannot afford to have freight trains continue to crawl their way through Chicago. "It costs everybody who buys something," LaBelle said, calling the effect "a hidden tax, a hidden surcharge, that's part of the cost of goods that is embedded in the price of things we pay for." Still, opponents of the CN purchase of the EJ&E have enlisted some heavy hitters to support their cause. The lineup includes several area congressmen and both of Illinois' senators, Richard Durbin and Barack Obama. Canadian National's proposed purchase of the EJ&E is pending before the federal Surface Transportation Board, which is conducting an environmental impact study. The board could rule on the proposal before the end of the year.